If I wanted to add Fred. The G.'s experimental horse artillery battery to my 1/72 Prussian SYW army, how would I go about it? Which figures (plastic or metal) for the gunners? Which artillery piece would suffice? A limber...what would that look like & who would supply it? As a battery in my rules is a single artillery piece & the number of gunners indicates the number of guns, I don't need much. No one? No ideas at all? Well if you are referring to a topic of FredG,s if you put a Link to it ,it would certainly help everyone looking at it, to understand more fully what you are asking of them. A boxed set from 1994 might well serve for 3 or 4 pounder Prussian guns. Sorry Donald I posted before I finished the post. No offense meant. OK? and here are 2 different artillery-trains ..
Then I would agree with Paul that the Revell 7YW Artillery set might be the best source for figures. Or, perhaps, the Imex AWI artillery sets. The guns in these sets are only 2 or 3lbers though. 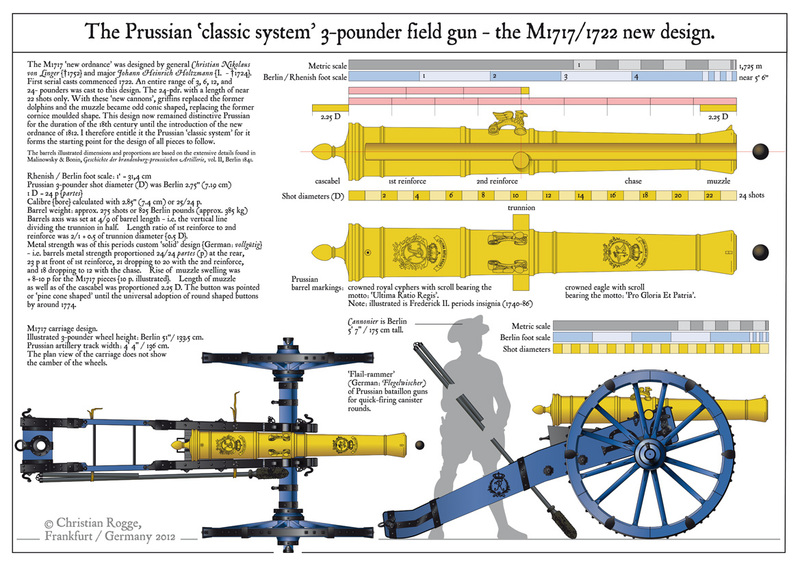 Wikipedia says Fred's experimental horse artillery used 6lber guns. The Zvezda Great Northern wars artillery sets have nice 6lbers. The Strelets sets from the same period have guns that might be 6lbers but not as nice. HaT's late Napoleonic Prussian artillery has a 6lber barrel, it looks like it's swimming in the carraige when you mount it but you could perhaps do some carpentry on the carraige. The gun in HaT's 1806 artty set is apparently a 12lber. All of the limbers in these sets look pretty much like the one in Pauls link so I'd guess that's what you're looking for, it's pretty much the same as HaT's Napoleonic French limbers too. How many figures do you think you'll need? Edit: Thomas posted while I was typing this, those Hagen figures look very nice too. I hadn't thought about Hagen, so thanks, Thomas. Graeme, the Revell SYW Austrians seem to me to not be too accurate. The coat is large & I think Fred,the G. instituted smaller coats (to save money). Maybe the IMEX AWI? The HaT 1806 carriage might be good....like most people I have loads of extra tubes, some of which are 6 pounders & one might work. As the Prussians only ever had a single battery, I only need one. In my rules a gun model represents a battery, with the number of guns shown by the number of crew members. So, 4 figures? As I have none of the plastic sets needed, it may be cost effective to buy the Hagen stuff. I recently bought one box each of the Revell Austrians and Imex Americans with the idea of using them for Jacobite rtebellion artillery. I'll probably have more figures than I need for the guns I've got and I don't have an imediate use for a 7YW limber. You'd still need to find the guns. The Imex figures are wearing breeches and gaiters rather than riding boots and the coat tails are about the same length as the Revell figures though the coat doesn't look as voluminous. I guess the Hagen figures might have the advantage of actually looking like Prussians. BTW where are you, Graeme? Yes, I'm in Brisbane but I think my brain is elsewhere at the moment. We should meet up some time. Are brains optional? I shouldn't find that a problem, personally. I realise minds have already set a pattern to an end on this topic,but after trolling Fred`s posts I found what I had remembered seeing. ` Over The Hills And Far Away', Feb 2017. Very easy to find on this Forum. I thought it might be of interest to some,and others also.